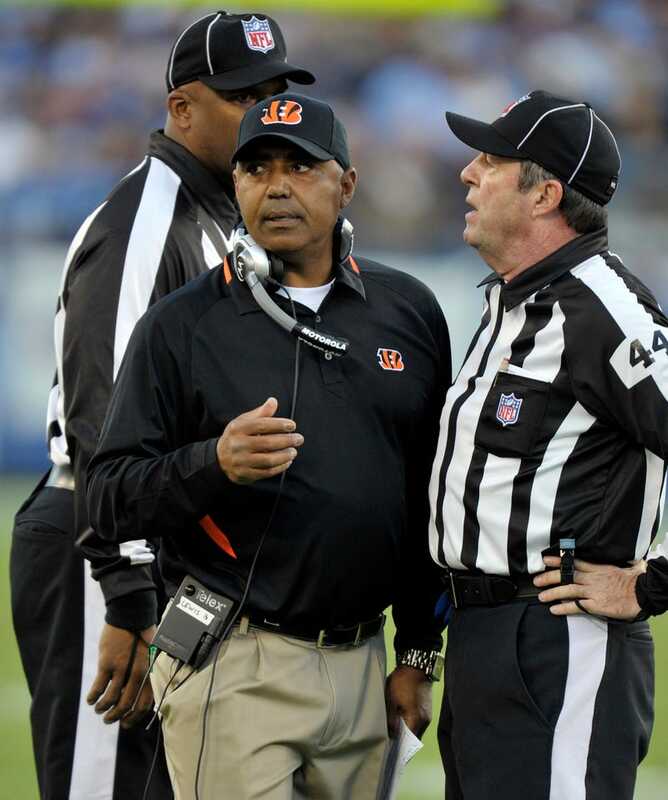 Marvin Lewis's Opinion Of The Replacement Refs? "Whatever The Commissioner Says Is Right." Every morning, the fine folks at Sports Radio Interviews sift through the a.m. drive-time chatter to bring you the best interviews with coaches, players, and personalities across the sports landscape. Today: The Bengals coach already knows what he'll say about the refs tonight if asked. Marvin Lewis joined Artrell and Andy on Fox Sports Radio to discuss tonight's game in Baltimore, the passing of Art Modell, the replacement officials (although he didn't have much to say) and the situation Chad Johnson has found himself in. "Never missed practice. He was there every day in his golf cart and he always was hilarious with some of his one-liners through my six seasons there with him." "Whatever the commissioner says is right." "We have to be consistent all the way through. The other 2o-some runs he had, 30 runs he had in the two ballgames were held to three yards or less. I think he had one maybe nine-yard run. But we have to do a tremendous job. He's a great runner, great balance and we've played against him a lot. We have to - both in the passing game as a receiver, with the checkdowns, with the screens - all of those things, you have to do a great job playing great leverage and getting 11 guys to the football." "Very surprised at the situation that occurred and, yes, I've been in contact with Chad a few times. In fact, actually, even after the fact before I knew he was released he probably thought I was crazy for the things I was advising him to do not knowing he wasn't on the team anymore. But it's an unfortunate situation. I hope that he can rebound out of this, get some opportunities to play this year in the NFL." • Jason Witten's return galvanized the Cowboys. • Only Kevin Ogletree's friends started him in fantasy football.